At Compass Associates, we traditionally celebrate the end of quarter three slightly earlier so that it can coincide with our Compass Christmas Party. This year, we again offered employees a choice of daytime activity. 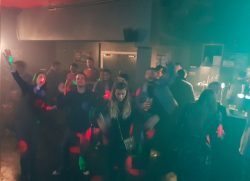 This time the choices included; ice skating, Laser Quest, bingo and beer tasting. One group headed to Portsmouth's Guildhall Square and enjoyed a leisurely glide around the open air ice rink, followed by hot chocolates in the bar. 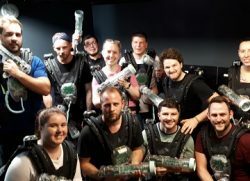 Another made their way to Portsmouth's Historic Dockyard and entered the Laser Quest arena for two high octane games of red vs blue. In 2018 our Charity Committee have been looking at different ways to fundraise and support good causes. One of those ideas was to host a charity gig for Community Christmas. Following on from a fantastic fundraising effort for the charity last year, the Committee wanted to see if they could raise even more to help combat loneliness at Christmas. The National Care Awards celebrated it's 20th year with a wonderful, glittering ceremony in Central London. The National Care Awards are the UK's longest running care awards, recognising the very best in the care sector. 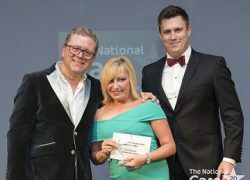 Impressionist and comedian Jon Culshaw hosted this year's awards providing some excellent comedy throughout the evening. For the sixth consecutive year, Compass Associates sponsored the Care Operations Manager of the Year award category. This year's award was presented to Debbie South from Hallmark Care Homes. Congratulations to Debbie and the rest of the evening's winners and nominees.